Assassin’s Creed: Rogue is this year’s stopgap entry in the swollen series – the Revelations to Unity’s, er, Assassin’s Creed III. On second thoughts, that’s probably not a helpful analogy. But Rogue makes a good case for its existence. While Paris is conspicuously landlubbery, Ubisoft Sofia have brought out full sails to ensure the North Atlantic is a worthy successor to Black Flag’s Caribbean Sea. Life on a Templar ship is different. Grand Master Haytham Kenway, who we’d assume would make a quick cameo, actually appears to have a position in your crew. And for once as an (in this case former) assassin we’ve picked a side – aiding the British against the French. British ships won’t fire on you unless harassed, and don’t offer much in the way of rewards for sinking them. Access to British coffers means you’re equipped with the “most advanced weaponry of the age”. Shay’s crew can fire explosives at fast-moving brigs to temporarily incapacitate them, and then get the ram in. Or use the puckle – an early machine gun – to pick at weak points exposed by broadside cannons. Burning oil, meanwhile, seems a much more effective means of dealing with pursuing enemies than the hopefully-plopped-out explosive barrels of Black Flag. The weather isn’t quite what it was in the Carribean, either. Lengthy swims in freezing water can kill Shay, and dynamic weather can bring on blizzards – reducing line-of-sight, triggering rogue waves and occasionally tornados. 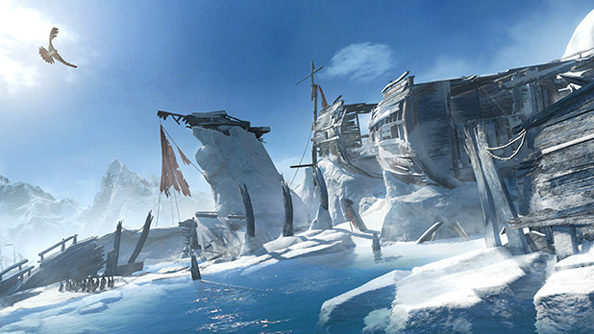 Destroying icebergs can clear your way, but also release collectibles like animus fragments and frozen cargo. Frozen shipwrecks, meanwhile, are jumping puzzles buried in the environment – an opportunity to appreciate the creaking boards and beautiful Northern Lights, or hunt for penguin-like auks and polar bears. Breaker rams are needed to break through ice sheets – but these are gained only by progressing through the story. Before then, it seems frozen water will be used to block off particular areas until the late game. And most importantly, there are around 20 new shanties. Some Irish, some from New York – and the rest returning favourites from Black Flag. 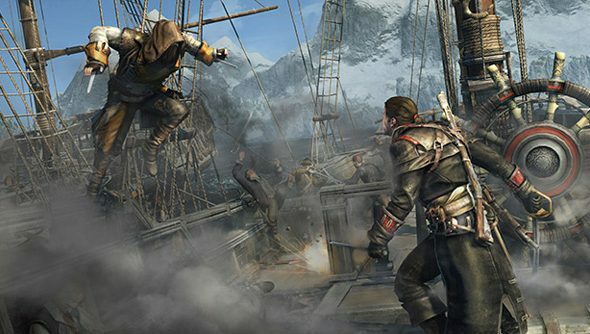 Assassin’s Creed: Rogue is out on November 11 for the consoles – though there’s been no PC date given yet. Will you bother boarding Shay’s boat if it turns up after Unity?